Nestled in the heart of Tuscany, Camping Baia del Marinaio is a luxury camping site that offers a wide range of amenities and has been a popular destination for many years. If you're looking for the ideal family camping holiday then Baia del Marinaio is the ideal destination. This site offers a variety of LUX-camp facilities; why not stay in a modern and comfortable mobile home? With Wi-Fi, bike rental, a doctor on site and free showers, Baia del Marinaio will allow you to make the most of your camping holiday. 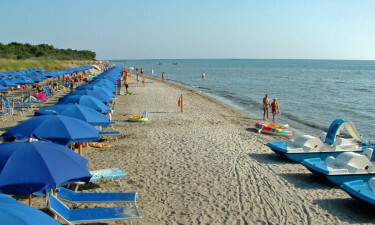 Tuscany is renowned for being one of the most beautiful places in the world, and the Camping Baia del Marinaio holiday camping site is perfectly situated for the local coastline and countryside, and the stunning villages, towns and cities. Why not hire a car and explore the area? You're sure to find plenty of hidden gems. The surrounding area is ideal for those with an interest in activities, and the area is perfect for water sports, cycling and walking. Camping Baia del Marinaio offers the best of both worlds for water-lovers, with a large and exciting pool complex as well as a stunning beach only meters from the site. The gently sloping shore makes this beach safer and ideal for children. Sunbeds and umbrellas can be rented to keep you cool in the shade. 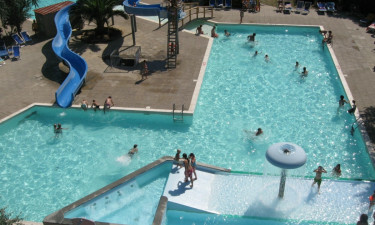 The pool complex is large enough to never be too crowded, and contains a water slide and other features. It is a great place for you to relax while your kids have fun in the water. For those looking for an action-packed holiday, filled with activities, Baia del Marinaio luxury camping is the ideal destination. The site offers games, sports, tournaments and shows to entertain the entire family. There is a football pitch on site to allow the kids to blow off steam, as well as animation and baby dance classes. 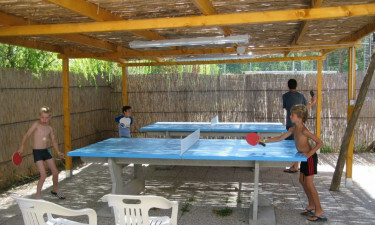 There is even a kids club with enthusiastic staff to keep your little ones entertained. There are 2 restaurants and 2 bars on site. The restaurants are traditional pizzeria style, serving a variety of pizza and other traditional Italian dishes. They also offer a takeaway service, and holidaymakers can choose between a half-board and a full-board service. The bars serve a variety of soft drinks and alcoholic drinks. There are 2 shops on site. One is a grocery shop that enables you to buy everything you could need for a self-catering stay, such as bread, milk, cheese and meats. There is also a bazaar that sells a variety of foreign newspapers and magazines, as well as sweets and cigarettes.